Peacefully with her family by her side, Joan Louise Merko, passed away at the Brandon Regional Health Centre on Sunday, July 29, 2018. Born in Maryfield, Saskatchewan April 4, 1951, Joan lived on the family farm at Ryerson, Saskatchewan, and attended Bond School. Together with her parents Tom and Marguerite, sister Lynn, and brother Jim, the family moved to Brandon in 1960, where she attended Green Acres School. Following graduation from Harrison High, Joan completed the Business/Secretarial course at ACC, and was then hired by the Provincial Government where she worked for Probation and Court Services. She married Al Merko September 8, 1973, and they had 2 sons. Joan became a stay at home mom, but rejoined the workforce working for St. Augustine's Church Library, Scouts Canada, and the Federal Government Research Station for the Canadian Food Inspection Agency (office) until retirement. Joan was always very active volunteering and following her two boys in sports and activities. 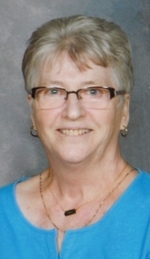 An avid curler, she became a life member at the Riverview Curling Club and in her spare time enjoyed golfing, camping and travelling with her husband. Joan is lovingly remembered by her husband Al Merko; son Steve (Carla) Merko; son Dave (Natasha) Merko; granddaughters Madison and Ava; sister Lynn (Ron) Bohrn and family, and brother Jim (Bev) Renwick and family. She was predeceased by her parents, sister Ann Renwick, and parents-in-law Peter and Elsie Merko. The Celebration of Joan's Life took place at Memories Chapel on Thursday, August 2, 2018. Rev. Fr. Christopher Dubois of St. Augustine's Roman Catholic Church officiated. Eulogy was delivered by her best friend Sharon Chrismas. Urn bearer was her beloved husband Al. Interment followed at Rosewood Memorial Gardens. Donations in memory of Joan may be made to ALS Society of Manitoba, 2A-1717 Dublin Avenue, Winnipeg, Manitoba R3H 0H2 or the Brandon Regional Health Centre Foundation, 150 McTavish Avenue East, Brandon, Manitoba R7A 2B3.